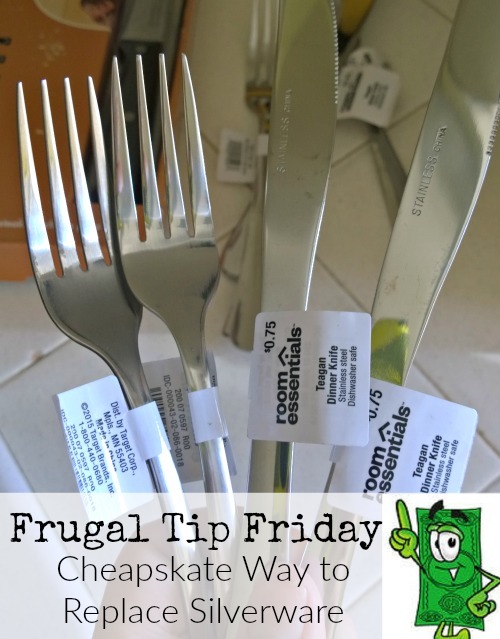 Return of frugal tip Friday series and today it's: Frugal Friday - Cheapskate way to replace missing silverware. When it comes to some things, I admit, I am a cheapskate. Mostly because I have to be. I live in California and it is expensive to live here but I also like being a stay at home wife and mom so watching the buck is a must. One item or items I should say, that always seem to disappear around here, is our silverware. I would shutter at the thought of buying a new set of everyday utensils to replace lost silverware, so what I do is hit the Target kitchen area and pick up a few of whatever I am missing. These stainless steel babies were .75. You can't go wrong there. Our set is somewhat mismatched but who cares. I just need ample amounts for the large dinners when the kids are all here. For special occasions I have a nice set of silver from my mother in law but those are washed and put away immediately. You could pick up pieces from the thrift store too to replace lost flatware. It's not about how much money you make, but how much you save! Our newsletter goes out each Friday. Subscribe and we would be happy to send it to you. When I'm lucky, I might find a piece at my local thrift store. We also have an Amish/Mennonite store not far away that once carried a pattern so close to mine that I picked up several spoons at a great low price. Spoons always seem to be the ones that walk out of my kitchen. Great tip! I have often bought serving pieces and replacements at the outlet stores - they sell the single pieces at a low price, which is terrific. I'll have to check that out the next time I'm in Target. We could use a few more pieces. I think mismatched pieces is more interesting. I always keep my eye out at thrift stores. My kids and I all have "favorites" which are easily identifiable because they all look different. Haven't had any luck lately at Goodwill, they are all those super cheapos from the dollar store. I'll have to check Target, thanks for the tip! Great tip! These would also be the pieces to send out with hubby to work... just in case he loses them :) Thank you for sharing on the Art of Home-Making Mondays!